Unbeknownst to many people, Google PSI (Page Speed Insight) tool recently rolled out a new update. This was the first major update they’ve done since January 2018, which is when they first started using real users’ data from their Chrome browser to measure a site’s page speed. Today’s update uses Lighthouse (a speed tool created by Google) for its analysis engine and incorporates field data from CrUx (the Chrome User Experience Report) into the tool. Version 5 of the Google PSI API was released in November 2018. Lighthouse is being used as the engine for analyzing everything. It also incorporates field data from CrUX. All the CrUX data and Lighthouse audits are also incorporated. This means that any previous versions will be phased out over the next 6 months. Field data from the Chrome User Experience report will show you the First Input Delay (FID) and First Contentful Paint (FCP). Lab data is presented in a screen shot for you. This information comes from Estimated Input Latency, First Contentful Paint, First CPU Idle, Speed Index, First Meaningful Paint, and Time to Interactive. Opportunities will show you a variety of ways in which you can improve a specific page’s performance including anywhere there are issues. You’ll also notice how such issues are slowing your page down. All of this is information about Google PSI isn’t only important because it makes your web site faster, but it also helps with your SEO – ensuring that it ranks well in Google. Additionally, this is a great way to improve your users’ experience when they arrive at your web site. It’s a great way to truly improve your data and metrics when you’re interested in knowing just how fast your web site is moving. This is because Google PSI also shows you lots of places where you can improve your pages so that they’re faster. 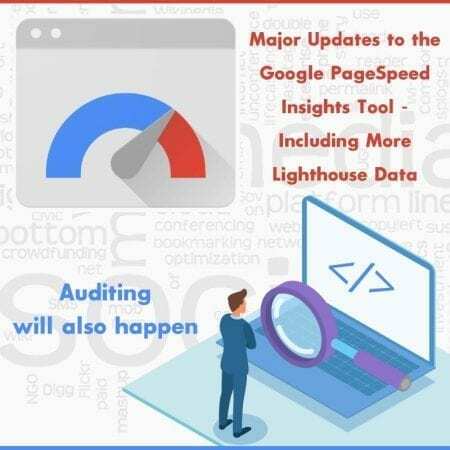 With all these great benefits to Google PSI and the numerous ways it can also improve your SEO you’d probably agree that this report is something that’s worth the time to look at. By doing so you should find several ways to quickly improve your web site’s page speed. An even newer version of this will be released in May 2019 so you’ll have a lot to keep up with. If it ever becomes too much for you though, make sure you contact us at Affordable SEO Company so we can manage this for you.